To report the outcomes of LASIK re-treatments after small incision lenticule extraction (SMILE). Retrospective review of all eyes to have undergone a re-treatment by LASIK after primary SMILE between September 2013 and January 2016. Thin-flap LASIK was used in most cases as long as sufficient tissue was available for safe flap creation between the maximum epithelial thickness and minimum cap thickness. Otherwise, the SMILE interface was converted into a LASIK flap by the Circle technique or side cut only. The multivariate nomogram for LASIK re-treatments was used, including sphere, cylinder, age, and primary spherical equivalent (SEQ) as variables. Patients were observed for 1 year after surgery and standard outcomes analysis was performed. A total of 116 LASIK re-treatments were performed in a population of 2,643 consecutive SMILE procedures, indicating a re-treatment rate of 4.39%. Mean attempted SEQ was −0.05 ± 0.99 diopters (D) (range: −1.88 to +1.50 D). Mean cylinder was −0.70 ± 0.55 D (range: 0.00 to −2.25 D). Postoperative uncorrected distance visual acuity was 20/20 or better in 81% of eyes, for a population with corrected distance visual acuity (CDVA) of 20/20 or better in 95% before re-treatment. Mean postoperative SEQ relative to the target was +0.19 ± 0.49 D (range: −0.88 to +2.13 D), with 74% within ±0.50 D. Mean postoperative cylinder was −0.29 ± 0.24 D (range: 0.00 to −1.25 D). There was one line loss of CDVA in 15% of eyes, but no eyes lost two or more lines. There was a small increase in contrast sensitivity (P < .05). Overcorrection was identified in myopic re-treatments (n = 20) of −1.00 D or more; mean postoperative SEQ was +0.59 ± 0.64 D (range: −0.63 to +2.13 D). Re-treatment after SMILE by LASIK achieved excellent visual and refractive outcomes, although these results indicate that myopic LASIK retreatment after primary myopic SMILE requires a different nomogram than for myopic LASIK re-treatment after primary myopic LASIK. 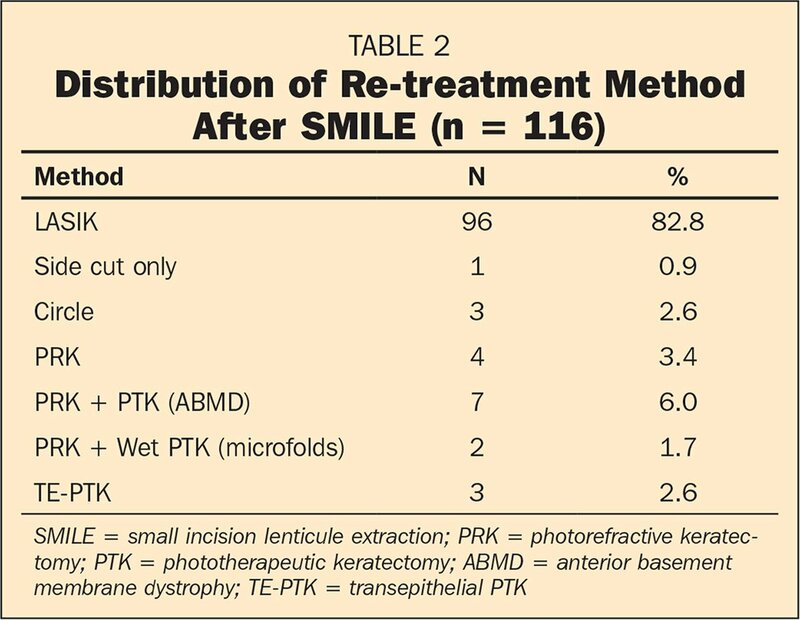 Although it was initially thought that a re-treatment after small incision lenticule extraction (SMILE) would have to be done by photorefractive keratectomy (PRK),1 there are now several different re-treatment options after SMILE. The first series of re-treatments published after SMILE were performed by PRK according to this original concept.2,3 Due to the demand for an alternative option, a method was developed to convert the existing SMILE cap interface into a LASIK flap. This can be done by either performing a side cut only to convert the cap into a flap or using the Circle option to extend the existing cap into a flap with a larger diameter.4,5 Finally, a LASIK procedure can be performed if there is sufficient space anterior to the existing SMILE interface to safely create a flap. The side cut only technique has been previously described for LASIK re-treatments where the flap margin has been compromised (eg, by previous epithelial ingrowth).6 However, the disadvantage is that the flap diameter is limited to be within the diameter of the cap. Given that the cap diameter is usually no greater than and sometimes smaller than 8 mm, a LASIK flap with an 8-mm diameter restricts the optical zone that can be used safely for an excimer laser ablation. Therefore, a side cut only may not be appropriate if a large optical zone is needed, such as if a hyperopic or topography-guided ablation is required. Three different Circle designs are available for use in the VisuMax femtosecond laser (Carl Zeiss Meditec, Jena, Germany) software, which have been studied and compared in a rabbit study by Riau et al.4 It was found that the “junction up and down” cut was the easiest to lift because the flap bed extension is intended to be at the same depth as the original cap with an up and down junction cut to ensure that the new interface connects with the existing interface. The ease of lifting the flap was described as being equivalent to lifting a standard LASIK flap or side cut only flap. Using scanning electron microscopy, it was found that the flap bed was undisrupted with smooth transition between the Circle interface and the original cap interface. It has been our protocol to use a cap of at least 135 μm to preserve the anterior stroma to minimize the disturbance to the corneal nerve plexus8–10 and take advantage of the stronger corneal lamellae in the anterior stroma.11–14 When using a thicker cap, there is almost always sufficient room to safely create a LASIK flap so that the re-treatment can be performed as thin-flap LASIK. Therefore, the Circle procedure is a good option for cases where the original cap was thin, but thin-flap LASIK may be preferable if a thicker cap was used to maximize the residual stromal thickness. Finally, there is a new method being developed to perform a re-treatment as SMILE. Donate and Thaeron15 have recently published the first case of a new sub-cap-lenticule technique where only the lenticular cut is performed (the lower interface of the lenticule) with the depth programmed to intersect with the existing cap, hence creating a complete lenticule. The surgeon can then open the existing small incision to access, separate, and remove the new lenticule. This method therefore enables a re-treatment to be performed exactly like a primary SMILE. However, further studies are required to establish the safety of this method. For example, epithelial thickness profiles have not yet been taken into account when resecting tissue under a previously created cap. The aim of the current study was to report the outcomes of re-treatment after SMILE by LASIK. This was a retrospective, non-comparative case series of all consecutive re-treatment procedures after primary SMILE performed as LASIK between September 2013 and January 2017 by two highly experienced SMILE and LASIK surgeons (DZR, GIC) using the VisuMax femtosecond laser and MEL 90 excimer laser (Carl Zeiss Meditec, Jena, Germany) at the London Vision Clinic, London, United Kingdom. The only inclusion criterion was a re-treatment had been performed as LASIK, including thin-flap LASIK, side cut only, or Circle techniques. The date range includes the first SMILE re-treatments performed for our SMILE population. Informed consent and permission to use their data for analysis and publication was obtained from each patient prior to surgery as part of our routine preoperative protocol. Because this was a retrospective study, institutional review board approval was confirmed to be not required. A full ophthalmologic examination was performed by one of the in-house optometrists prior to re-treatment as has been described previously.16 Manifest refraction was performed based on a standardized protocol to push maximum plus and maximum cylinder, and all optometrists had undergone refraction training and validation with this protocol.17 The manifest refraction was repeated again at a separate visit before the day of re-treatment by the surgeon himself and this refraction was used to plan the treatment. The appropriate re-treatment technique was chosen based on anatomical imaging by either Artemis Insight 100 very high-frequency (VHF) digital ultrasound (ArcScan, Inc., Golden, CO) or RTVue optical coherence tomography (Optovue, Fremont, CA). The maximum epithelial thickness and minimum cap thickness were measured and used to evaluate whether a new LASIK interface could be safely created, avoiding the creation of a cryptic buttonhole (gas breakthrough) by the interface crossing into the epithelium and without crossing the existing cap interface and potentially creating tissue slivers or multiple interfaces that would be difficult to handle. Residual stromal thickness safety was calculated by subtracting the flap thickness and the ablation depth at the location of the thinnest corneal pachymetry as measured by VHF digital ultrasound or optical coherence tomography. Central ablation depth was used for hyperopic treatments rather than the maximum ablation depth. A bias of 18 μm (four standard deviations)22,23 was added to the intended flap thickness and a minimum predicted residual stromal bed thickness of 250 μm was required. In cases where a thin cap had been used or the layered pachymetry measurements found that there was insufficient space for a thin flap to be created, the retreatment was performed as side cut only or Circle. If the patient had demonstrated clinically significant anterior basement membrane dystrophy, the re-treatment was performed as a surface procedure including a phototherapeutic keratectomy (PTK) component to address the anterior basement membrane dystrophy.24 If there were visually significant microfolds in the cap, a surface procedure was performed so that the folds could be treated using the “wet PTK” technique to polish the surface.25,26 A surface procedure was also used if there was insufficient tissue available for a full refractive correction by LASIK according to the limits of the flap thickness that could be used due to the epithelial thickness. Finally, a transepithelial PTK procedure was performed if there was irregularly irregular astigmatism.25,26 Only cases treated as LASIK, side cut only, and Circle were included in the analysis. All treatments were performed as bilateral (for bilateral treatments) simultaneous LASIK using the VisuMax femtosecond laser27–30 and the MEL 90 excimer laser. The Tissue Saving Ablation profile was used at 250-Hz pulse frequency for all cases, with an optical zone between 5.75 and 6.5 mm for consecutive myopic cases and 6.5 and 7 mm for consecutive hyperopic or mixed cylinder cases. The same nomogram was used as for flap lift retreatments after LASIK at London Vision Clinic, with separate nomograms for consecutive myopia and consecutive hyperopia that take into account the treatment that the cornea has previously undergone. These multivariate nomograms include sphere, cylinder, age, and primary spherical equivalent refraction (SEQ) as variables and account for average epithelial thickness profiles, and hence power shifts present after corneal refractive surgery. The target postoperative sphere was hyperopic for all patients younger than 42 years; a linear function was used whereby the target sphere was +0.66 D for a 21 year old down to plano for a 42 year old. Our micro-monovision protocol16 was used for all patients older than 42 years, where the target sphere is plano for the dominant eye and −1.50 D for the non-dominant eye for most patients. Initially, the flap lift was performed using the standard bimanual technique that we have described previously for primary LASIK with the VisuMax laser.34 In this technique, the flap lifter and McPherson's forceps are inserted at the hinge, with one instrument held in place to provide counterforce for separating the interface with the second instrument. Because the primary SMILE treatments used superotemporal and superonasal small incisions, these were located close to the entrance point of the instruments in the standard technique. To avoid the instruments inadvertently entering the small incision to create a tear or accessing the original SMILE interface, the surgical technique was evolved, as previously described.35 The standardized inferior pseudo-hinge fulcrum technique (Figure 1) involves inserting the two instruments in the inferior third of the flap, applying some upward pressure, and “tenting up” the flap to avoid the instrument breaking through to the SMILE interface. One instrument is held in place by the unseparated inferior portion of the flap to provide counterforce for the second instrument to separate the interface superiorly. The inferior third can then be separated using the standard method. This method means that the superior small incision is approached with the whole arm of the instrument already inside the flap interface, virtually eliminating the possibility of the tip inadvertently entering and tearing the small incision. Series of images describing the inferior pseudo-hinge fulcrum technique for lifting a LASIK flap in an eye that has previously had small incision lenticule extraction (SMILE). The aim of the technique is to avoid placing the tip of either instrument in the vicinity of either of the small incisions because this may tear the flap. (A) The flap lifter is used to open the flap side cut in the inferior third of the flap. (B) The flap lifter is pushed across the flap and used to open the flap side cut on the opposite side to create an access point for the McPherson's forceps. This motion is made with some upward force to avoid the instrument tip breaking through to the original SMILE interface. (C) The McPherson's forceps is inserted to the mid-point of the flap and swept superiorly, thereby separating the region of the small incision with the arm of the instrument and not the tip. The flap lifter is held in place using the inferior unseparated portion of the flap to provide counter-traction for the McPherson's forceps. A second sweep is made to separate the other half of the flap. (D) The McPherson's forceps is then placed against the superior hinge to provide counter-traction for the flap lifter to be used to separate the inferior portion of the flap in the usual manner. Reprinted with permission from Reinstein DZ, Archer TJ, Carp GI. The Surgeon's Guide to SMILE: Small Incision Lenticule Extraction. Thorofare, NJ: SLACK Incorporated; 2018. The remainder of the procedure was performed according to the standard technique described previously for primary LASIK with the VisuMax laser.34 In some cases, the flap might be slightly thicker than expected and/or the ablation might be deep enough to cross the existing SMILE interface. Therefore, extra care was taken when wiping the stromal bed to ensure that the edges of the buttonholed stromal component of the cap were not raised or rolled open. 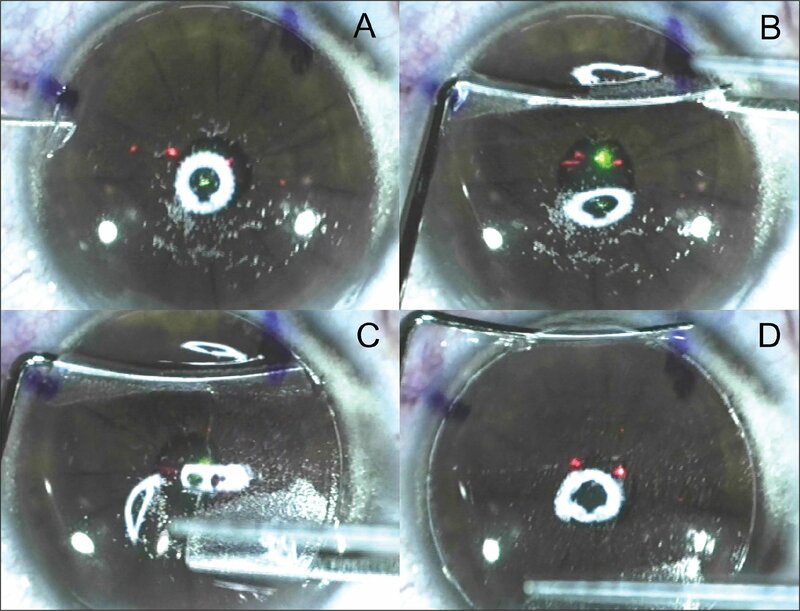 Flap repositioning was performed with minimal flap manipulation and minimal volume but high-speed flow irrigation, using a 27-gauge anterior chamber cannula attached to a 5-mL luer lock syringe to expel 1 mL of fluid in 1 second, so as to generate a high fluid pressure stream. This protocol avoids hydrating the flap or bed while effectively “blowing” particles from the interface, with the goal of having no gutter at the end of the case. Micro-adjustments to the flap were made at the slit lamp with heavy fluorescein staining immediately after the procedure. A dry surgical microspear was used to distend the flap and smooth out any microfolds by stroking from the center toward the periphery. Patients were instructed to wear plastic shields while sleeping for 7 nights. Tobramycin–dexamethasone (Tobradex; Alcon Laboratories, Inc., Fort Worth, TX) and ofloxacin (Exocin; Allergan Ltd., Marlow, United Kingdom) were applied four times daily for the first week, which is our standard protocol for broad spectrum prophylaxis. Patients were reviewed at 1 day, 1 month, 3 months, and 12 months. The 1-day postoperative visit was conducted by the surgeon, including a slit-lamp examination, binocular and monocular uncorrected distance visual acuity (UDVA), and a spherical manifest refraction. The flap was adjusted at the slit-lamp using a surgical spear if any microfolds were identified. All subsequent follow-up visits were conducted by one of the in-house optometrists and included measurements of monocular and binocular UDVA, manifest refraction, and CDVA. Best-corrected mesopic contrast sensitivity was evaluated at the 3- and 12-month visits. Postoperative complications including microfolds, epithelial ingrowth, interface haze, interface debris, infection, superficial punctate keratitis, and diffuse lamellar keratitis were assessed at each visit using a six-grade classification system: trace, Grades I to II (not visually significant), and Grades III to V. In this scale, trace refers to any small amount inconsistent with an untreated cornea, even if not visually significant. 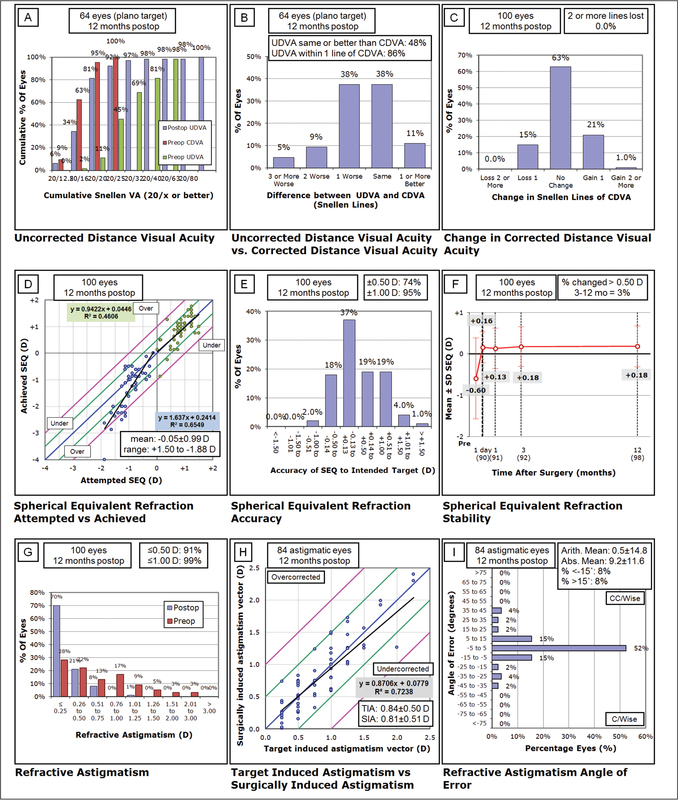 Outcome analysis was performed according to the Standard Graphs for Reporting Refractive Surgery.36 Data from the 12-month visit were used for analysis if available, otherwise the 3-month data were used. Student's t tests were used to calculate the statistical significance of any changes in log contrast sensitivity. Microsoft Excel 2010 (Microsoft Corporation, Seattle, WA) was used for data entry and statistical analysis. A P value of less than .05 was defined as statistically significant. During the study period, a total of 116 re-treatments were performed in a population of 2,643 primary SMILE treatments performed up to the end of January 2016 (to allow for 1 year of maturity prior to qualifying for a re-treatment), indicating a re-treatment rate of 4.39%. 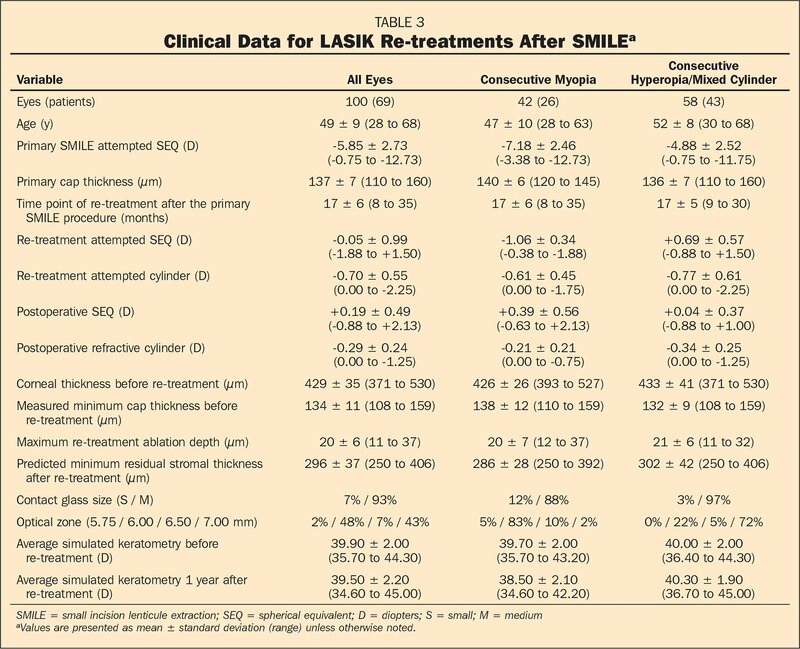 Table 2 shows the distribution of the retreatment method used, with 100 eyes undergoing a re-treatment as LASIK. A flap thickness of 170 μm was used in one patient to create a flap underneath the existing SMILE interface due to the presence of a scar that had been caused by a cap perforation during the primary procedure. One-year data were available for 98 eyes (98%) and 3-month data were used for the remaining 2 eyes. Table 3 lists the clinical data for the population treated. Based on the predicted ablation depth and programmed flap thickness, the ablation was expected to cross the SMILE interface in 8% of eyes. Figure 2 shows the Standard Graphs for Reporting Refractive Surgery. 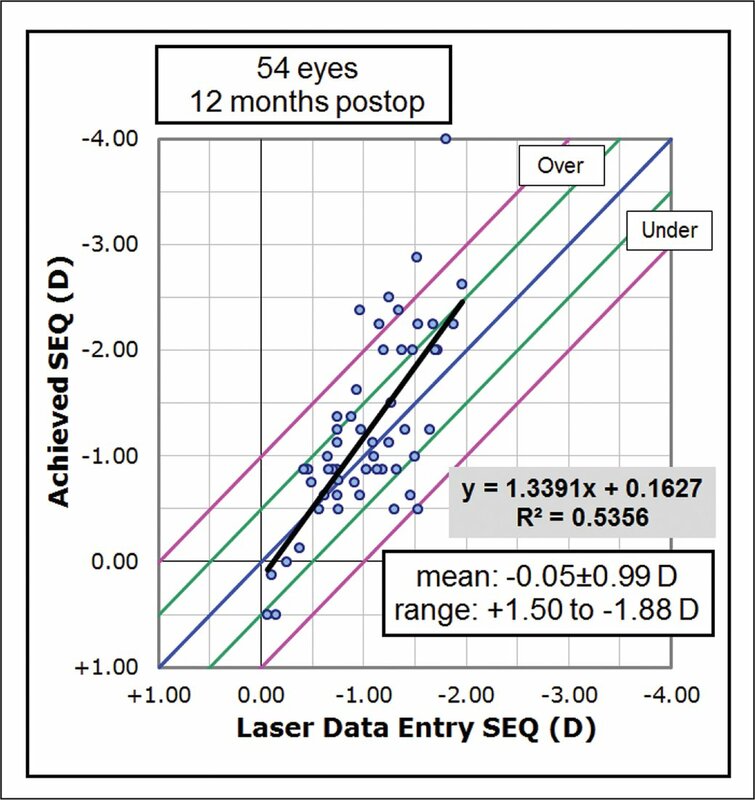 Figure 3 shows the laser data entry versus achieved SEQ scatter plot for the subgroup of re-treatments for consecutive myopia. 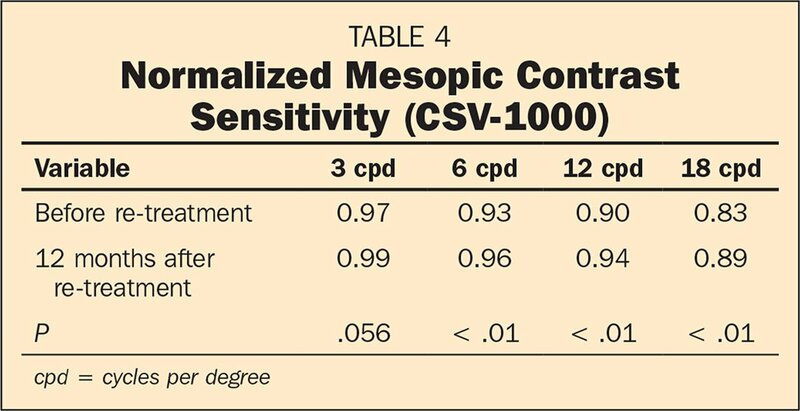 Table 4 includes the normalized mesopic contrast sensitivity data before and after the re-treatment showing that there was no change at 3 cycles per degree (cpd) and a small, but statistically significant increase at 6, 12, and 18 cpd. Table 5 summarizes the incidence of intraoperative complications. These complications have been described in a previous report, which also showed that there have been no intraoperative complications in the last 84 consecutive treatments since finalizing the bimanual inferior pseudo-hinge fulcrum technique.35 No complication led to abortion of the procedure and no eyes lost two or more lines of CDVA. There was one line loss of CDVA in 2 eyes relative to before the re-treatment, but this was equal to the original preoperative CDVA in both cases. Table 6 summarizes the postoperative complications at the 3-month time point. There were no visually significant complications (Grades III to V). The current study found thin-flap LASIK to be a viable and convenient re-treatment option after SMILE, showing excellent efficacy, predictability, and safety. 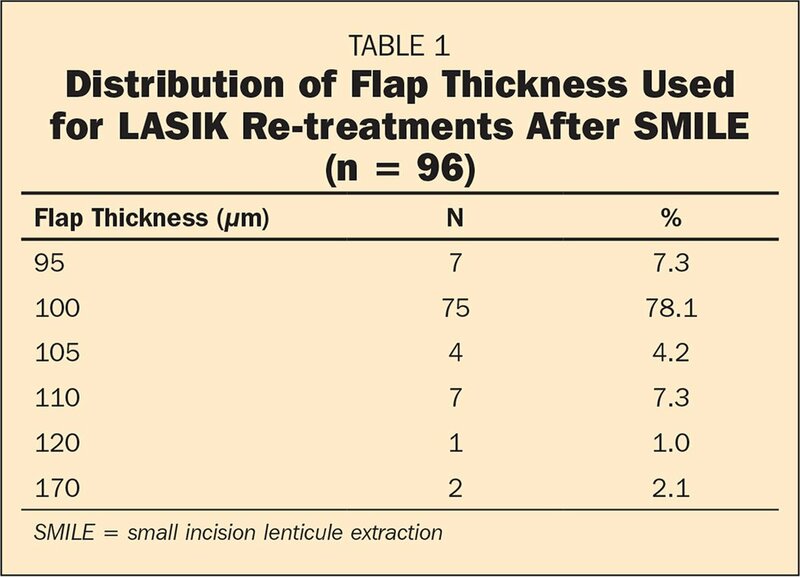 Thin-flap LASIK can be used as long as there is sufficient tissue between the maximum epithelial thickness and minimum cap thickness for the safe creation of a flap, which should be confirmed by direct measurement before surgery. The intraoperative safety was optimized by evolving the surgical technique for lifting the flap to keep the instrument tips away from the superotemporal and superonasal small incisions and tenting up the instruments to avoid accessing the existing SMILE interface. As can be seen from the attempted versus achieved SEQ scatter plot, the consecutive hyperopic group was on target on average, but there was a trend for overcorrection in the consecutive myopic group. For the subgroup of myopic re-treatments of −1.00 D or more (n = 20), mean postoperative SEQ relative to the intended target was +0.59 ± 0.64 D (range: −0.63 to +2.13 D). This finding implies that consecutive myopic LASIK after primary myopic SMILE requires a different nomogram than for consecutive myopia after primary myopic LASIK, given that the flap lift re-treatment nomogram had been used in this population. This is demonstrated by Figure 3, which shows the scatter plot of the laser data entry against achieved SEQ for the consecutive myopic treatments. Although there was still an overcorrection, the slope of the regression line was reduced from 1.64 to 1.33. Examples of an Artemis Insight 100 very high frequency digital ultrasound (ArcScan, Inc., Golden, CO) epithelial thickness profile after small incision lenticule extraction (SMILE) for low myopia (−2.75 diopters [D]). The epithelial thickness profile is thinner centrally and thicker paracentrally, which is the opposite to that observed after myopic LASIK. The relative dominance of the minimum lenticule thickness in low myopic SMILE (20 μm in this example) means that the epithelial thickness profile appears more similar to a hyperopic than myopic treatment. Reprinted with permission from Reinstein DZ, Archer TJ, Carp GI. The Surgeon's Guide to SMILE: Small Incision Lenticule Extraction. Thorofare, NJ: SLACK Incorporated; 2018. The main limiting factor for using LASIK for retreatment after SMILE is the cap thickness of the primary procedure. If the cap thickness was less than 135 μm, then there may not be sufficient room to safely create a flap above the existing SMILE interface. Based on epithelial thickness remodeling studies, the epithelial thickness is unlikely to be thicker than 80 μm after a myopic SMILE procedure.40 (The epithelium can thicken more after hyperopic correction, to as much as 110 μm,41 so this protocol should be adapted for retreatments after hyperopic SMILE.) Therefore, a 100-μm flap thickness is required to minimize the risk of a cryptic buttonhole. A 100-μm flap would be expected to be no thicker than 118 μm based on the flap reproducibility of the VisuMax laser. However, the possibility that the original SMILE interface was thinner than intended should also be taken into account, meaning that the cap thickness would need to have been at least 136 μm (adding a further 18 μm) to minimize the risk of a flap crossing the original SMILE interface. The safety of planning the flap thickness based on direct measurement of the epithelium and cap thickness was demonstrated by the fact that there were no cases of either cryptic buttonhole (gas breakthrough) or crossed interfaces in this population. Therefore, because the majority of SMILE treatments in the early years of SMILE were performed using a cap thickness of 120 μm, and the Circle option was not available until 2014, SMILE re-treatments were commonly performed as PRK. The outcomes of PRK after SMILE have been published by Siedlecki et al.2 for a population of 43 eyes of 1,963 primary procedures (retreatment rate 2.2%). Mitomycin C was used for all cases in this study. UDVA was 20/20 or better in 63% of eyes at 3 months, relative to 73% with CDVA 20/20 or better before the re-treatment. The mean postoperative SEQ was +0.03 ± 0.57 D with 80% of eyes within ±0.50 D of the intended target. Significant haze developed in 1 eye, but resolved after prolonged topical dexamethasone treatment. No eyes lost two or more lines CDVA. Liu et al.3 also published outcomes for PRK after SMILE. Of a population of 524 eyes, 14 eyes (re-treatment rate 2.7%) underwent a PRK re-treatment with mitomycin C. Risk factors for re-treatment were age older than 35 years, preoperative SEQ greater than −6.00 D, refractive cylinder greater than 3.00 D, and intraoperative suction loss. UDVA was 20/20 or better in 64% of eyes, relative to 79% with CDVA 20/20 or better before the re-treatment. A recent study by Riau et al.42 in rabbits has provided evidence for an increased wound healing response after PRK as a re-treatment following SMILE, observing excessive inflammation and corneal haze, which was greater than that observed for a primary PRK control group. However, this study used a Technolas excimer laser (Bausch & Lomb, Rochester, NY), which has been reported to induce significant haze when performing PRK after LASIK.43 The findings might be different using an excimer laser that has a lower thermal load on the corneal tissue. When using thin-flap LASIK for re-treatment after SMILE, the ablation may cross the existing SMILE interface. However, re-treatments are usually for very low corrections and therefore very low ablation depths, with a mean of 20 μm and maximum of 37 μm in the current study. Therefore, the ablation crossing the SMILE interface was expected in only 8% of cases. This might be expected to be associated with an increased risk of interface haze. However, there was trace haze observed in only 5% of eyes at 3 months, which had recovered completely in all eyes by 1 year. This is in contrast to the excess inflammation and haze reported for PRK after SMILE as described above.42 No eyes lost two or more lines of CDVA (95% confidence interval was 0.03%) and contrast sensitivity was not changed. LASIK provides a safe and simple re-treatment option after SMILE, which avoids the disadvantages of surface ablation, such as haze and inflammation, particularly when used as a re-treatment. Thin-flap LASIK is an appropriate choice when a thicker cap has been used to avoid tissue slivers or cryptic buttonhole. Ideally, the epithelial thickness and cap thickness should be directly measured and mapped across the whole diameter to use for flap thickness planning. In cases where a thin cap was used, side cut only or Circle provide a suitable alternative. Intraoperative complications can be minimized by using an inferior pseudo-hinge fulcrum technique. Tuisku IS, Lindbohm N, Wilson SE, Tervo TM. Dry eye and corneal sensitivity after high myopic LASIK. J Refract Surg. 2007;23:338–342. Ozgurhan EB, Agca A, Bozkurt E, et al. Accuracy and precision of cap thickness in small incision lenticule extraction. Clin Ophthalmol. 2013;7:923–926. Reinstein DZ, Srivannaboon S, Archer TJ, Silverman RH, Sutton H, Coleman DJ. Probability model of the inaccuracy of residual stromal thickness prediction to reduce the risk of ectasia after LASIK part I: quantifying individual risk. J Refract Surg. 2006;22:851–860. Reinstein DZ, Srivannaboon S, Archer TJ, Silverman RH, Sutton H, Coleman DJ. Probability model of the inaccuracy of residual stromal thickness prediction to reduce the risk of ectasia after LASIK part II: quantifying population risk. J Refract Surg. 2006;22:861–870. Reinstein DZ, Carp GI, Archer TJ, Vida RS. 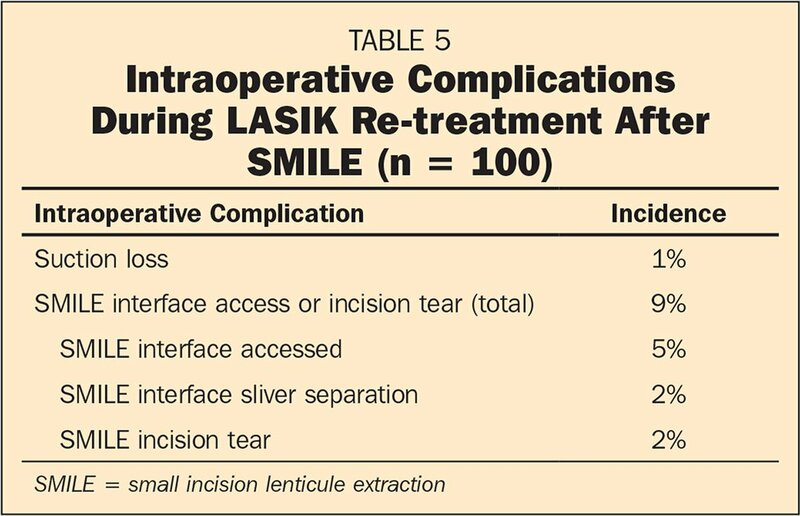 Surgical technique and intraoperative complications of retreatment by LASIK after SMILE. J Cataract Refract Surg. In press. Reinstein DZ, Archer TJ, Carp GI. The Surgeon's Guide to SMILE: Small Incision Lenticule Extraction. Thorofare, NJ: SLACK Incorporated; 2018. Gyldenkerne A, Ivarsen A, Hjortdal JO. 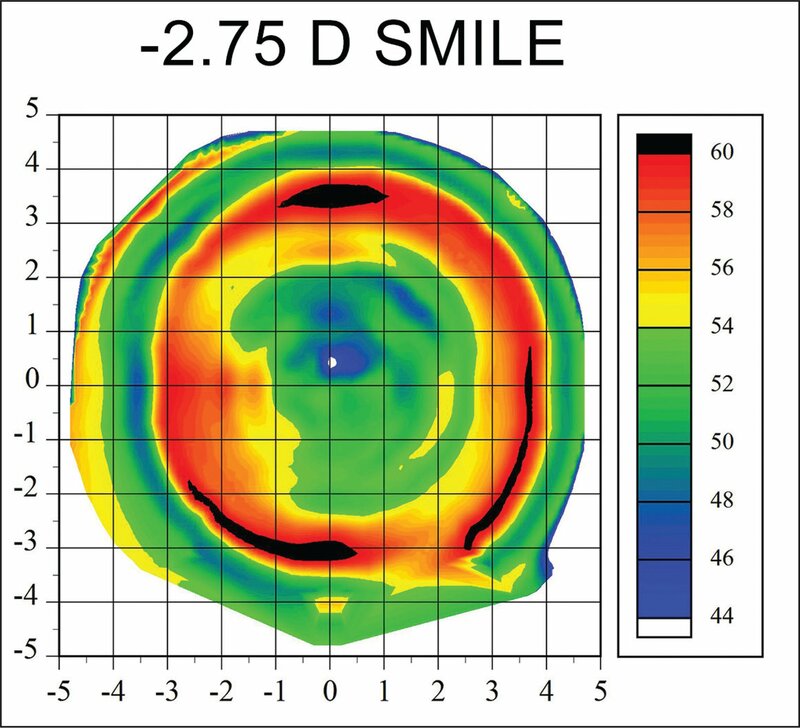 Comparison of corneal shape changes and aberrations induced By FS-LASIK and SMILE for myopia. J Refract Surg. 2015;31:223–229. From London Vision Clinic, London, United Kingdom (DZR, GIC, TJA, RSV); the Department of Ophthalmology, Columbia University Medical Center, New York (DZR); Centre Hospitalier National d'Ophtalmologie, Paris, France (DZR); and Biomedical Science Research Institute, University of Ulster, Coleraine, Northern Ireland (DZR). Dr. Reinstein is a consultant for Carl Zeiss Meditec (Jena, Germany) and has a proprietary interest in the Artemis technology (ArcScan, Inc., Golden, Colorado) through patents administered by the Cornell Center for Technology Enterprise and Commercialization (CCTEC), Ithaca, New York. Drs. Carp and Archer receive travel expenses from Carl Zeiss Meditec. The remaining authors have no proprietary or financial interest in the materials presented herein.